BACKGROUND AND PURPOSE: Carotid artery stent placement (CAS) may be associated with clinically silent cerebral lesions. We prospectively evaluated the association of the number of solid cerebral microemboli during unprotected CAS with the frequency of silent cerebral lesions as detected by diffusion-weighted MR imaging (DWI). METHODS: We performed multifrequency transcranial Doppler detection of solid microemboli in the ipsilateral middle cerebral artery (MCA) during CAS in 27 consecutive patients with symptomatic high-grade carotid stenoses. No embolus protection was used in any of the cases. DWI before and 24 ± 2 hours after CAS was used to detect new ischemic lesions. RESULTS: We detected 484 solid microemboli in 17 patients (63%). On MR imaging 24 ± 2 hours after CAS, 6 patients (22%) had developed 13 new clinically silent DWI lesions within the ipsilateral MCA territory. In patients with Doppler evidence of solid emboli during CAS, the incidence of new DWI lesions was higher (29%) than in patients without Doppler evidence of solid emboli during the procedure (10%); this difference was not statistically significant (P = .25). The number of solid microemboli during CAS in patients with new ipsilateral DWI lesions was not significantly different from that in patients without new ipsilateral DWI lesions. CONCLUSIONS: Solid microembolism is a common event during unprotected CAS; however, the frequency of procedure-related silent cerebral lesions appears to be independent of the number of solid cerebral microemboli during the procedure. Carotid artery stent placement (CAS) for the treatment of carotid artery stenoses has emerged as a potential alternative for carotid endarterectomy (CEA).1–3 At present, several randomized multicenter trials are underway to compare the efficacy and outcome of CAS versus CEA (CREST in the United States, EVA-3S in France, ICSS in the United Kingdom, and SPACE in Germany). The major risk of CAS appears to be the possibility of periprocedural embolic strokes due to release of debris during endovascular manipulation and subsequent distal embolization of solid material into the cerebral circulation. In addition to this immanent risk of procedure-related apparent strokes, intra-arterial angiographic procedures may be associated with clinically asymptomatic cerebral ischemic lesions as visualized by diffusion-weighted MR imaging (DWI).4–8 Such DWI lesions have been assumed to indicate the occurrence of silent cerebral embolism during angiographic procedures.4 Following CAS, new cerebral DWI lesions have been found in 16% of interventions.9 It is not known, however, whether the frequency of cerebral DWI lesions is related to the amount of periprocedural distal embolization of solid particles. Transcranial Doppler sonography (TCD) has been used to detect cerebral microemboli during cerebral angiography and during carotid angioplasty.10–17 The clinical significance of microemboli as detected by TCD during angiographic procedures, however, has remained ambiguous because conventional Doppler instrumentations do not discriminate solid emboli from gaseous microemboli (ie, air bubbles). In contrast to conventional TCD, multifrequency TCD allows differentiation between solid and gaseous emboli by insonating an embolus simultaneously with 2 different ultrasound frequencies. The present study evaluates for the first time the occurrence of solid cerebral microemboli during CAS. We assessed the widespread hypothesis that the frequency of silent ischemic lesions is related to the solid embolic load during the procedure. Twenty-seven consecutive patients (23 men and 4 women; median age, 62 years) scheduled to undergo CAS within an ongoing, prospective CAS safety trial in our institution were enrolled in the study (Table 1). All patients had a symptomatic high-grade (70%–99%) stenosis of the carotid bifurcation or the proximal internal carotid artery (ICA), according to the North American Symptomatic Carotid Endarterectomy Trial methods of measuring carotid stenoses.18 All carotid stenoses were due to atherosclerotic disease as visualized by duplex sonography. None of the patients had undergone prior carotid artery interventions or prior neck radiation. Pretreatment anticoagulation and antiplatelet medication regimens consisted of acetylsalicylic acid (100 mg per day), clopidogrel (75 mg per day), and enoxaparin (0.5 mg/kg of body weight twice per day) for 3 days before and after CAS. The combined antiplatelet medication regimen was continued for 30 days after CAS. Acetylsalicylic acid was continued indefinitely. The CAS procedure was divided into 5 phases. Phase 1: Endovascular treatment was initiated by installing a 7F sheath (AVANTI+; Cordis Corporation, Miami, Fla) in the right femoral artery. A diagnostic sidewinder catheter (6F, 90-cm length, SIM 2 Super Torque; Cordis Corporation) was navigated into the common carotid artery (CCA). After an initial angiogram, the activated clotting time was elevated to a minimum of 250 seconds by intravenous application of heparin. A stiff-type guidewire (0.035-inch, 260-cm length, Radifocus Guide Wire M; Terumo Corporation, Tokyo, Japan) was introduced into the target lesion-related external carotid artery, and the diagnostic catheter was removed. A 7F introducer catheter (Vista Brite Tip; Cordis Corporation) prepared with an inner 5 guiding catheter was navigated into the CCA along the guidewire, and both the guidewire and the inner catheter were removed. Phase 2: A 0.014-inch guidewire (ACS Hi-Torque Balance Heavyweight; Guidant Europe S.A., Diegem, Belgium) was navigated through the stenosis into the distal ICA. Phase 3: A self-expanding stent (Carotid Wallstent, 7.0 × 30 mm; Boston Scientific, Natick, Mass) was navigated into the ICA and was deployed over the stenosis. After stent delivery, the stent catheter was removed. Phase 4: With the guidewire maintained in the distal ICA, a balloon dilation catheter (Bypass Speedy, 20-mm length, 5.0–6.0-mm diameter; Boston Scientific) was navigated to the residual stenosis inside the stent and was inflated to a pressure of 7–12 atmospheres for 5 seconds. Phase 5: After dilation, the balloon was deflated, and the balloon catheter was removed. In all cases, catheters were continuously flushed with saline unless a guidewire obturated the catheter lumen. A final angiogram was performed, including the treated vessel, the distal ICA, and the intracranial branches. Angiograms were performed with intra-arterial applications of radiographic contrast agent (Imeron 150; Altana, Konstanz, Germany). The angiograms were evaluated for the degree of carotid stenosis and for occlusion of intracranial branches. No endoluminal embolus protection device was used in any of the cases. MR investigations were performed before and 24 ± 2 hours after CAS (Magnetom Symphony 1.5T; Siemens, Erlangen, Germany). The MR protocol included fluid-attenuated inversion recovery imaging (TE, 108 milliseconds; TR, 7900 milliseconds; TI, 2500 milliseconds) and an isotropic DWI sequence (TE, 77 milliseconds; TR, 2600 milliseconds; b = 0, 500, and 1000). New ischemic lesions were evaluated from DWIs (b = 1000) and from images of the apparent diffusion coefficient (ADC). All patients underwent neurologic assessment before, immediately after, and 24 ± 2 hours after CAS. Neurologic complications were assumed in case of new neurologic deficits, including cranial nerve involvement, visual impairment, motor or sensory deficits, language or speech deficits, or extinction and inattention. The MES counts were not normally distributed (Kolmogorov-Smirnov/Lilliefors test, P < .001). Therefore, nonparametric tests (Friedman test, Wilcoxon test, Mann-Whitney U test, and Kendall τ correlation) were used for statistical analysis as appropriate. The association of nominal variables was tested by using the Fisher exact test. A P value ≤.05 indicated statistically significant differences. All procedures and investigations where performed in accordance with the guidelines of the local institutional review board. In all cases, CAS was completed successfully and the final angiogram demonstrated complete vessel restoration. There were no postinterventional embolic occlusions of intracranial branches in any of the angiograms. None of the 27 patients had neurologic complications immediately after or within 24 ± 2 hours after the intervention. We detected 35,075 HESs during the 27 CAS procedures. Of the 35,075 HESs, 3565 were identified as MESs, and 31,510 were identified as artifacts. Discrimination of the 3565 MESs classified 484 MESs (14%) as solid microemboli and 2900 MESs (81%) as gaseous microemboli. In addition, 181 MESs (5%) were given uncertain classifications. The 484 solid microemboli were detected in 17 of the 27 patients (63%), and no solid emboli were detected in 10 patients (Table 1). The quantity of solid microemboli during the various steps of CAS was distributed unequally (Friedman test, P = .005; Table 2): Most solid microemboli occurred during stent delivery and during balloon dilation. The number of solid microemboli was significantly correlated with neither the severity of carotid stenosis (τ = 0.18; Z = 1.28; P = .19) nor patient age (τ = 0.05; Z = 0.34; P = .73). On MR imaging 24 ± 2 hours after CAS, 6 of the 27 patients (22%) had developed 13 new DWI lesions within the ipsilateral MCA territory (Table 1). One of the 27 patients developed a new DWI lesion within the contralateral hemisphere and another patient within the cerebellum (patients 6 and 22; Table 1). All new DWI lesions were consistent with embolic events (ie, a cortical or subcortical distribution, or located in the territories of perforating arteries; Fig 1). The frequencies of new DWI lesions were related to patient age: patients with new DWI lesions were significantly older than patients without new lesions (median age, 74 years [range, 57–87 years] vs 59 years [range, 31–89 years]; P = .016), and the number of new DWI lesions correlated positively with patient age (τ = 0.40; Z = 2.93; P = .003). DWI (b = 1000) of the brain before (A) and 1 day after (B) stent placement of the right carotid artery. 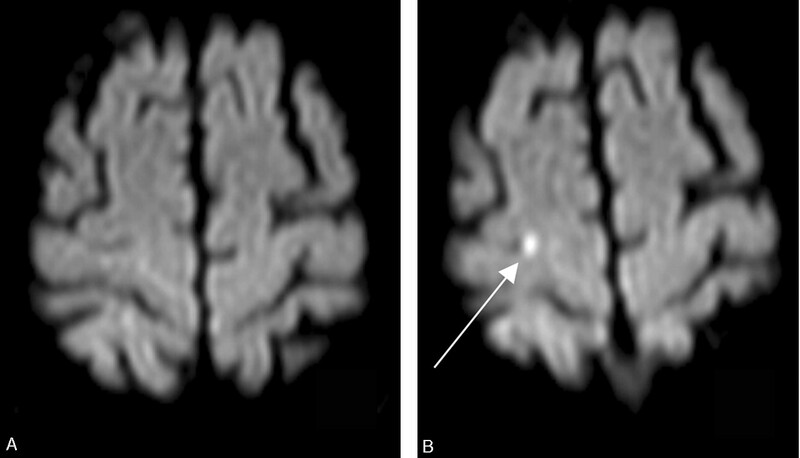 A small new cortical lesion within the ipsilateral hemisphere is visible (arrow). Five of the 17 patients (29%) with TCD evidence of solid MES during CAS had developed DWI lesions on the day after the procedure, whereas 12 of these 17 patients had not developed new DWI lesions (Table 1). 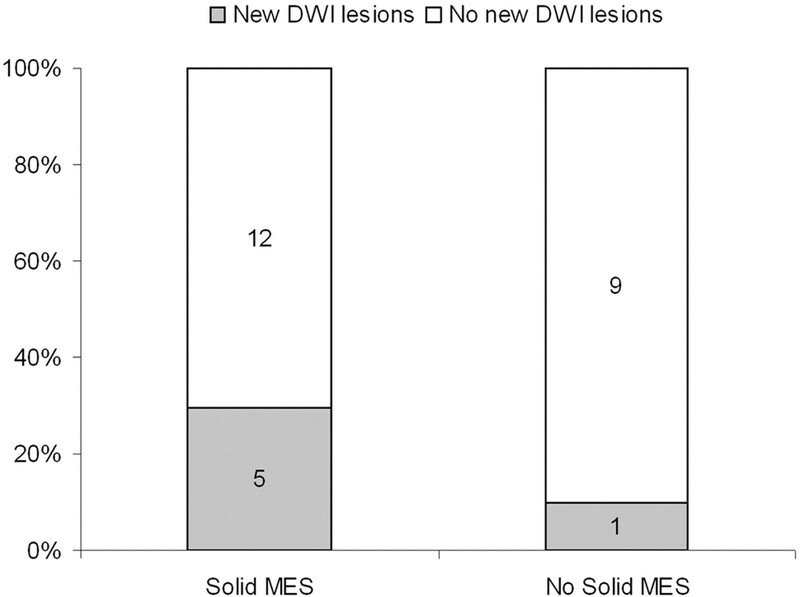 Conversely, only one of the 10 patients without solid MES during CAS had developed DWI lesions on the day after the procedure, whereas 9 of these 10 patients had not developed new DWI lesions. This difference, however, was not statistically significant (P = .25; Fig 2). Regarding the patients with evidence of solid emboli during CAS, the number of solid microemboli in patients who suffered from new ipsilateral DWI lesions (median solid MES count, 9 [range, 1–54]) was not different from that in patients who did not develop new ipsilateral DWI lesions (median solid MES count, 21.5 [range, 1–119]; P = .721). Intra-arterial cerebral angiography and angiographic procedures (eg, CAS) are associated with an imminent risk of clinically silent embolic events.4–7,9,17 Nevertheless, the contribution of solid embolization during angiographic procedures to the frequency of embolic lesions awaits further clarification. This study shows for the first time that most cerebral microemboli that occur during CAS are gaseous, whereas <15% of microemboli are solid. Moreover, our data suggest that the frequency of procedure-related ischemic lesions is independent of the number of solid microemboli during the procedure. This, of course, does not mean that solid embolism during CAS may not cause ischemic brain damage. On the contrary, distal embolization seems to be the major risk of CAS. However, the contribution of the amount of solid microemboli during angiographic procedures to the frequency of clinically silent ischemic lesions as detected by MR imaging may have been overestimated in the past. MES may be detected not only during CAS, but also during CEA. By use of conventional TCD, CAS has been reported to be associated with more than 8 times the rate of microemboli seen during CEA.14 These data, however, do not discriminate solid from gaseous microemboli, and it is likely that most of the numerous microemboli seen during CAS in that study represent injected gas bubbles rather than solid particles. There are no data in the literature on the prevalence of solid microembolic Doppler signals during CEA or on the association of solid microemboli during CEA with the frequency of cerebral lesions. Similar to our results, van Heesewijk et al found no correlation between the occurrence of ischemic lesions after CAS and the embolic load during the procedure as evidenced with TCD sonography.17 They used conventional TCD embolus monitoring, however, and thus did not discriminate solid from gaseous microemboli (ie, small air bubbles or contrast bubbles that become introduced into the circulation during injection of contrast or during flushing of angiocatheters).10,21 We used multifrequency TCD embolus monitoring, which allows differentiation between solid and gaseous microemboli by insonating an embolus simultaneously with 2 different sonography frequencies: Solid emboli reflect more sonography power at a higher frequency than at a lower frequency, whereas the opposite is the case for gaseous emboli.20 By using this technique, we were able to discriminate the rather small proportion of solid microemboli from the myriad gaseous microemboli that occur during angiographic procedures and correlate the number of solid microemboli during the CAS procedure with the frequency of new ischemic brain lesions. Multifrequency TCD embolus detection has been shown to automatically detect cerebral microemboli and reject artifacts with a high sensitivity and specificity19 and reliably differentiate between solid and gaseous microemboli.20 By use of embolus classification limits for solid emboli and choosing a Doppler energy threshold of 28 dB × milliseconds (Doppler power ≥ 7 dB, time duration ≥ 4 milliseconds), differentiation of emboli in clinical situations is reliable even when very small bubbles are present (eg, small air bubbles or contrast agent bubbles).20 When dual-gate TCD embolus monitoring combined with statistical classifiers is used, the sensitivity and specificity to separate artifacts from MESs are 94% and 97%, respectively.22 For the discrimination between solid and gaseous emboli, the method achieves a sensitivity of 81%–86% and a specificity of 81%–86%.22 Thus, modern TCD embolus detection devices are useful tools to evaluate the nature of circulating microemboli within clinical studies reliably. We used MR imaging with DWI sequences and ADC maps to detect new ischemic lesions. DWI lesions very sensitively reflect biophysical tissue properties related to the severity and duration of perfusion deficits.23 Several reports suggest that DWI provides superior detectability and detection rates of acute stroke compared with CT.24,25 In perfusion CT, small lesions have been missed even within the section levels.26 Thus, we believe that DWI is the most sensitive tool for early assessment of ischemic tissue impairment—especially for small lesions and lesions in the posterior circulation. Transcranial Doppler signals consistent with numerous cerebral gaseous microemboli may be detected during cardiopulmonary surgery27 and during injection of radiographic contrast during cerebral angiographic procedures.10 This indicates that cerebral air embolism may be the major cause of postoperative neuropsychological sequelae and may contribute to the potential risk of neurologic ischemic complications during angiographic procedures. There is little evidence, however, of the clinical impact of peri-interventional gaseous microemboli. Further investigation is needed to elucidate the potential ischemic risk of gaseous microemboli (eg, comparison of the incidence of ischemic cerebral events during angiographic procedures with and without use of air filter devices). Although we did not find an association of the patients’ age with the number of solid microemboli during CAS, increasing age was associated with a higher rate of new ischemic lesions. This suggests that, although being exposed to the same solid embolic load, older patients are at a higher risk of developing ischemic lesions during CAS than younger patients. Thus, the patients’ age seems to be an independent risk factor for silent ischemic cerebral lesions during CAS. We detected solid cerebral emboli during the entire CAS procedure even before the target lesion was involved. This suggests that solid emboli may not only be attributed to endovascular manipulation at the site of the stenosis, but also that manipulation within the aortic arch and the proximal supra-aortic arteries may detach debris fragments or platelet aggregates from the endothelium or from atherosclerotic plaques. Solid emboli during these early CAS phases may have caused the ischemic lesions outside of the territory of the treated vessel in 2 patients in this study; however, most solid microemboli occurred during stent deployment inside the stenosis and during balloon dilation. Manipulation with these large-crossing-profile devices (up to approximately 1.7 mm) at the site of the lesion therefore appears to be the most vulnerable step for distal embolization of solid particles during CAS. The discrepancy between the solid embolic load during CAS and the frequency of ischemic lesions observed in our study is in accordance with previous ex vivo studies on the relevance of solid microembolism during CAS. Rapp et al reported that, though carotid angioplasty frequently dislodges plaque fragments, the frequency of stroke is still low.28 They concluded that the brain appears to have a surprising tolerance for microembolization in the acute setting. Moreover, collection of embolizing debris particles during different techniques of CAS of human cadaveric carotid artery specimens showed that, though CAS with primary stent application (stent delivery and then balloon dilation) is associated with a lower frequency of embolic complications than CAS with secondary stent application (stent application after balloon angioplasty), the debris release during the procedure is not different in primary versus secondary stent application.29 The authors of that study concluded that the superiority of primary stent application may not be related to debris reduction and thus doubted the clinical importance of the amount of solid microemboli during CAS. The most plausible reason for the disparity between the solid embolic load and the frequency of ischemic lesions is that most solid emboli are small enough to pass the cerebral microcirculation and thus do not cause ischemic lesions, whereas most of the larger ones may divide into small fragments that pass the microcirculation as well; however, we found postinterventional ischemic lesions within the ipsilateral MCA territory even without TCD evidence of any solid emboli during the procedure. This suggests either that we did not detect all solid emboli or that at least some of the DWI lesions have been caused either by solid embolization after the end of the intervention or occurred independently of solid emboli (eg, air embolism). Our data suggest that solid microembolism is a common event during unprotected CAS. The frequency of procedure-related silent cerebral ischemic lesions, however, appears to be independent of the number of solid microemboli during the procedure. Further investigation is needed to evaluate the potential role of both the size of solid emboli and the prevalence of gaseous emboli in the development of silent ischemic lesions and to elucidate the impact of embolus prevention (eg, use of embolus protection devices and gas filter devices) on the solid and gaseous embolic load and on the frequency of procedure-related clinically apparent and silent cerebral lesions. This study was presented in part at the International Stroke Conference, February 5–7, 2004, San Diego, Calif, and at the European Stroke Conference, May 12–15, 2004, Mannheim, Germany. Accepted after revision February 17, 2005.